An ounce of prevention is worth more than a pound of cure when you are in the wilderness. 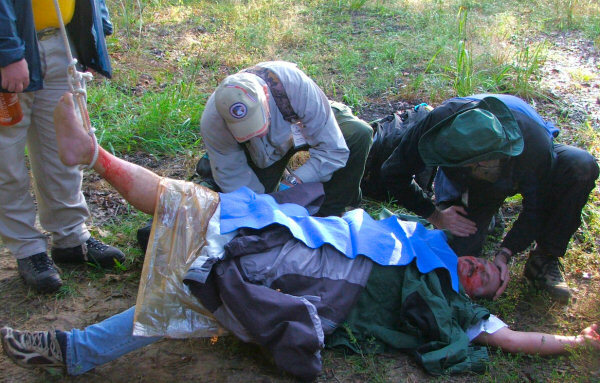 Wilderness First Aid is an American Red Cross program that focuses on prevention of accidents as well as handling the unique first aid care skills necessary when help is more than an hour away. This training is required for future High Adventure base experiences like Philmont and highly recommended for at least one adult in every Scout Troop and Venturing Crew. Here are the next 2 published course dates. Purpose: Learn how to prevent accidents in the Wilderness, but if something happens, you will learn how to respond to a situation that is more than 1 hour from EMS. Bring to Class: Comfortable clothes for outdoors, raingear, lunch and water bottle, Backpack or duffel with gear you would use on a wilderness activity. Course Registration Deadline: Wednesday preceding the course date.